For reliable charter bus service in and around Lake Buena Vista, choose Falcon Charter Bus. We’re known for our quality bus rentals, professional service, and wide variety of options. Call us today at 407-274-9847 for your free quote! Planning a group trip near Lake Buena Vista? Let us help you organize transportation to nearby attractions in Orlando including Disney World, Universal Studios, SeaWorld, and everywhere else you’d like to go. You’ll be paired with a clean, modern charter bus and a skilled, professional driver when you book with Falcon Charter Bus. For a comfortable ride, request complimentary amenities such as reclining seats, cushioned armrests, restrooms, and extra legroom. 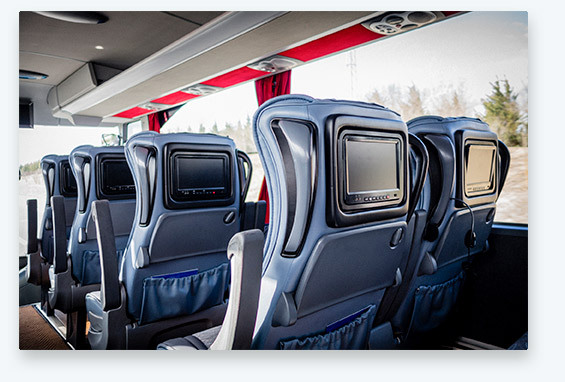 Depending on availability, you can book a bus with entertainment options like WiFi, television monitors, and DVD players (these are especially a hit with younger passengers). We strive to match your group with a bus that perfectly meets your needs and fits within your budget. Getting to Lake Buena Vista is easy with a private coach from Falcon Charter Bus! We service areas across the Southeast, including Charlotte, Atlanta, Miami, Tampa, Panama City Beach, Fort Lauderdale, and other popular cities. We’re always able to provide top-notch transportation for groups of any size, regardless of your needs or requests. Getting to all of your stops at Disney World, Universal Orlando, or SeaWorld is easy with a private charter bus. Keep your group together while you ride to every stop on your itinerary-- we’ll keep your trip flowing seamlessly so you won’t have to worry about missing time in the parks. We’ll match you with a knowledgeable driver who will make sure that you arrive at each stop on your itinerary right on time. Don’t rely on your hotel’s shuttle service-- schedule a minibus to operate on your group’s time and stop only at your predetermined locations. With us, you’ll enjoy personalized transportation throughout your trip. Ready to reserve your bus? Call us now at 407-274-9847 for your no-obligation quote, and your reservation agent will walk you through our simple reservation process. We’re looking forward to helping you plan your trip to Lake Buena Vista, Florida today!